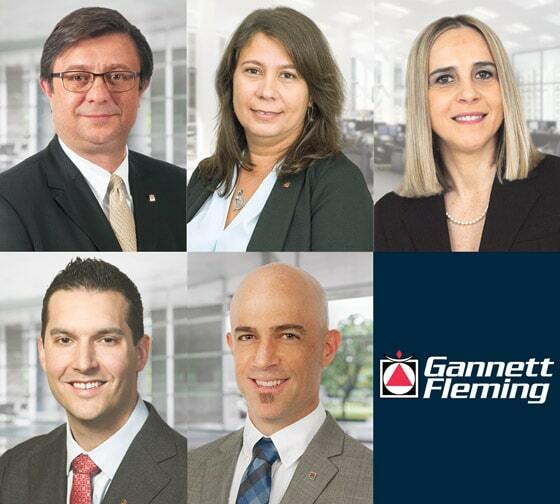 Gannett Fleming is pleased to announce its newest stockholders: Luis Casado, PE; Alina Fernandez, PE; Agnieszka Lapinski, PE; Bryan Shober, PE; and Stewart Vaghti, PE, CFM, ENV SP, LEED AP. Casado is a senior vice president and Water Business Line director with more than 25 years of experience on some of the most complex infrastructure projects in the southern U.S. and Central and South America. Based in the firm’s Miami office, he is responsible for overseeing the operations and strategic expansion of Gannett Fleming’s growing Water Practice and is a recognized thought leader on the topic of smart infrastructure. Committed to diversity and inclusion, Casado chairs Connected Allies, an avenue for employees to make Gannett Fleming a best-in-class firm for allyship. He also launched an internship program in the southeast that encourages the engineers of tomorrow. He earned his Bachelor of Science and Master of Science in civil engineering from the Georgia Institute of Technology. Fernandez brings nearly 20 years of experience to her roles as a vice president and transportation senior project manager. Based in Miami, she leads the highway team in Florida and is responsible for business development and project delivery for multidisciplinary projects that contribute to the growth of the Transportation Business Line in the Southeast Region. She was the project manager and engineer of record on the Northwest 74th Street Extension project, which won the 2010 Cuban-American Association of Civil Engineers Project of the Year award, in partnership with the Florida Department of Transportation and Miami Dade County Department of Transportation and Public Works. She earned her Bachelor of Science in civil engineering from Florida International University and is a recent graduate of the Florida Engineering Leadership Institute. Lapinski is a vice president, National Bridge Practice Leadership Team representative, and Bridge Design Group department manager. She is based out of Marlton, New Jersey, and has nearly 25 years of experience managing bridge design and rehabilitation projects of diverse sizes and complexities. She is a recognized industry thought leader, incorporating accelerated bridge construction concepts into transportation projects like the award-winning U.S. Route Nos. 1&9 and 46 Bridge Over Jones Road Replacement project. Her work with the $30 million New Jersey Turnpike Interchange 14A Improvements project led to recognition as a 2018 Gannett Fleming President’s Project Team Award winner. Lapinski earned a Bachelor of Science in civil engineering, a Bachelor of Science in architectural engineering, and a Master of Science in civil engineering from Drexel University. Shober is the Transit & Rail Systems’ Overhead Catenary System (OCS) group manager with nearly 20 years of experience. He is based in the Valley Forge, Pennsylvania, office and is responsible for providing project management, design oversight, engineering of catenary and electrified systems, and construction management for OCS installation. Shober manages more than 30 dedicated OCS engineers, designers, and technicians who service projects across the continent. His work with the $38.5 million Maryland Area Regional Commuter Wedge Storage Yard project led to Gannett Fleming winning the Maryland Quality Initiative Award of Excellence and the Gannett Fleming President’s Project Team Award. He earned his Bachelor of Science in civil engineering from Villanova University. Vaghti is a senior project manager and Collaborative Research & Innovation Center working group member based in the Phoenix office. Over his 20-year career, he has designed and managed best-in-class dams, storm drainage, erosion and sediment control, water and sewer main, and commercial, industrial, and residential development projects. As Gannett Fleming’s corporate sustainability officer, Vaghti ensures continued growth of the firm’s culture of sustainability by meeting sustainability targets, improving efficiencies, protecting resources, and reducing waste and emissions. He earned his Bachelor of Science in civil engineering from Northern Arizona University and serves on the Northern Arizona University College of Engineering Advisory Board.